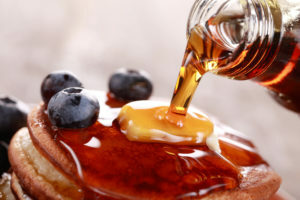 Is Maple Syrup Better for You Than Sugar? Discover the truth about questions that pique your curiosity in our series, “The Short Answer.” Wellness dietitian Kristin Kirkpatrick, RD, LD, fields this question. Q: Is maple syrup better than sugar? A: Some studies suggest that maple syrup’s antioxidant plant nutrients (phenols) offer health benefits. But more research is needed before we call it the next super food. Studies of maple syrup extracts don’t consider the impact of maple syrup on insulin and blood sugar. Maple syrup is a sugar, with no fiber attached to it. That means eating too much of it will cause swings in your blood sugar and insulin. This could lead to hunger, potential weight gain and other adverse health effects. If your goal is to improve your health, eating green leafy vegetables, whole grains, olive oil and other Mediterranean diet staples will give you lots more bang for your buck. Numerous studies prove that these foods lower your risk of chronic disease. That said, of all the sugars available, I like maple syrup because of the nutrients mentioned above. I pair it with a whole grain (in baking, in buckwheat pancakes) for fiber to prevent blood sugar and insulin swings.